Injury reports from our team trickled in the week after Paris-Nice. Bernie injured his face and wrist in a collision at Tirenno Adriatico. In the same race Cavendish fractured a rib and then fell again in the spectacular Milan San Remo crash. Renshaw is suffering from sinusitis. Scott Thwaites fractured his spine in a training crash. Mekseb broke his pelvis in Langkawi. Slagter has been feverish since Paris-Nice. Reinhardt is still recovering from early season surgery. On a positive note Nic Dougall and Edvald are recovering their good condition after suffering a broken wrist and gall bladder surgery respectively. These injuries demonstrate the fighting nature of the team. For example, Bernie crashed because he had been dropped on the penultimate climb but hit a car while digging extra deep to return for one last pull for Louis Mentejs before the final summit. Mekseb sitting fourth overall was battling for position in a bunch sprint. Cavendish had MSR victory in mind when he collided with a traffic barrier before the Poggio climb. That said, the team, called me to fill roster spots for two of the Flanders Classics. They aren’t typically my style of racing, but I felt up for the challenge and took it as an opportunity to learn and support our specialists, Edvald and Vermote. The riders outweigh the emaciated looking climbers in mountainous races by an average of twenty plus pounds. These are virtually Vermote’s hometown races, and the specialists know every cobble in ever meter of road. I relied on our directors for course information. The atmosphere surrounding these races feels closer to USA style athletics with tailgates, super fans, and massive crowds. There’s an art to the violence required to position for the narrow cobbled climbs and crashes are inevitable. Jenna came along to experience the spectacle. I tried for the breakaway but missed it and focused on supporting our leaders. If they stopped for a bike change, or nature break, so did I to help draft them back to the peloton. I positioned well for the first crunch point, and thought I could avoid the crash that happened ahead of me, but the rider to my right toppled into my front wheel. I hit the guard rail and Jay landed on my hip. Avoiding serious injury I chased back to the peloton. We had marked kilometre 117 as a critical point and as we worked forward a massive crash blocked the entire road. Without much hesitation I rode with Vermote into the field and around the carnage. Edvald was also in our group. Team Quickstep had missed the crash and was driving a group of forty up the road. I knew it meant the end of my race, but I pulled our group as hard as I could to bring our leaders back to the action. I fell behind in a group of twenty or so riders. We wanted to finish anyway but the ambulance passed by us and we detoured to the bus on open roads. Where there's no road, make one. After the scrum on Friday’s E3, I longed to be in the breakaway. I jumped on everything my legs would let me. Once I found myself in a promising move. “This is a good one. They’re blocking the road,” Jay said over the radio. But, the attacks continued for an hour. We covered 48 km in that hour. I was all in, and paid for it over the next five hours. I did my best to shelter Eddy and Julian. Ghent Wevelgem is known for blustery crosswinds and to me the race seemed even more nervous than in E3. I witnessed a few close calls that testified to the skills of the riders present, but also witnessed a few nasty wrecks. The sounds of cracking carbon and moaning riders haunt us all, but we shove those fears deep into our subconscious in order to barge our way through tight spaces, down precarious roads, and around unforeseen obstacles. I knew when the time came to put myself up front and stay there, but when space opened I stood on the pedals and all of the efforts I made in the first hour sat me down. I repeatedly advanced twenty positions, then lost twenty braking into the next corner. I tried to move up on the climbs with smooth efforts but crashes and tangles ahead blocked the road. Twice I found myself running up and around standstills on the steep banking beside the road. Over the Kemmelberg I moved around dropping riders, but as I climbed at 10 kph the front of the peloton careened down the narrow descent at 60 kph. 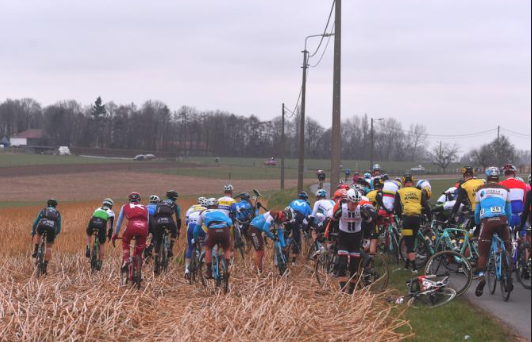 The peloton stretched into one line and I could see gaps opening in the open fields ahead. Our group of forty pursued for a while, but gave up the chase and sufficed to finish 11 minutes behind. Edvald flatted and Nic quickly gave up his front wheel, but Edvald never saw the front again. Julian made the first group of twenty riders and sprinted to 15th. The rest of the guys will spend the next two weeks thrashing Flanders classics. I, on the other hand, arrived home with Jenna at 1 AM after Ghent Wevelgem. During the whirlwind a brief cold took advantage of my fatigued immune system. The brief illness kept me in bed, insuring full physical recovery from Sunday's efforts and my symptoms have relaxed just in time for the Vuelta Pais Basque next week. On Wednesday, Edvald finally avoided bad luck, and placed fourth in a dirty edition of Dwars Door Waregem. I enjoyed it from the couch.